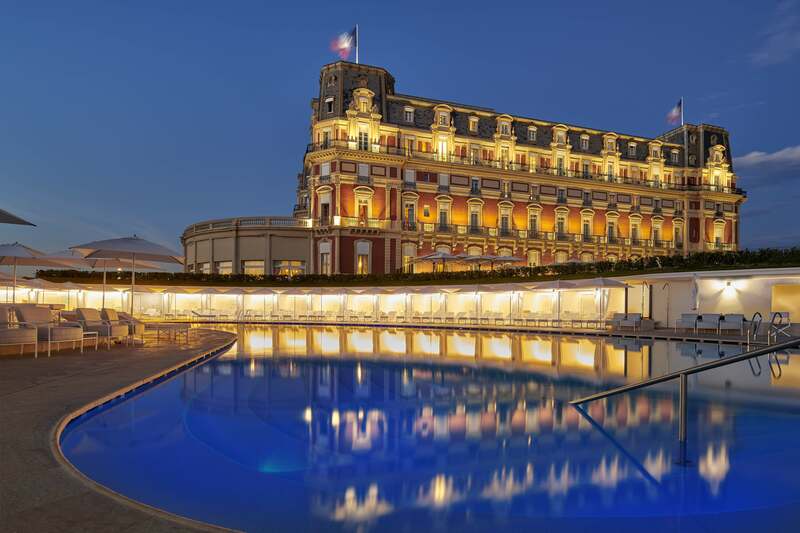 CHICAGO (October 26, 2018) Hyatt Hotels Corporation (NYSE:H) has announced today that a Hyatt affiliate has entered into a management agreement with Socomix for the Hôtel du Palais in Biarritz, France. This historic, luxury palace will be the third property in France to join The Unbound Collection by Hyatt brand, alongside Hôtel du Louvre in Paris and Hôtel Martinez in Cannes. As the sixth property in The Unbound Collection by Hyatt in Europe, the 142-room hotel will mark a significant milestone for the brand’s growth. In addition to Hôtel du Palais, Great Scotland Yard Hotel in London and Parisi Udvar Hotel in Budapest are expected to open under this brand before the end of 2019. As a living memory of the Biarritz history, the "Villa Eugénie", now Hotel du Palais, was built in 1855 by Napoléon III for his wife Eugénie de Montijo. With its captivating past, its exclusive, prime location facing the Atlantic ocean and its famous architecture and design, Hôtel du Palais will deliver on the brand’s promise to create story-worthy and shareable experiences for the modern traveler, making it a natural addition to The Unbound Collection by Hyatt portfolio. Guests will be able to follow in the footsteps of global celebrities who indulged in the alluring French glamour of this property, one of France’s prestigious palace hotels. The hotel will be fully renovated by renowned design companies, including Atelier COS, honoring traditional French luxury and the hotel’s rich heritage. A partial reopening is set to take place between July and October 2019, and final renovations are scheduled to be complete for a full reopening in June 2020. New features will include renovated guestrooms, two revitalized signature restaurants, a new lounge and bar, as well as restored public areas to create a lively local atmosphere for guests. There are currently eight other Hyatt properties open in France, including the new Hyatt Centric La Rosière, Hôtel Martinez in Cannes, Hyatt Paris Madeleine, Hyatt Regency Nice Palais de la Méditerranée, Hyatt Regency Paris - Charles de Gaulle, Hyatt Regency Paris Étoile and Park Hyatt Paris-Vendôme. Hotel du Louvre is currently under renovation and Hyatt Regency Chantilly is scheduled to open in late 2018 along with three additional hotels expected to open under Hyatt’s select service portfolio in the coming years: Hyatt Place and Hyatt House Charles De Gaulle Airport and Hyatt Place Rouen. Forward-Looking Statements in this press release, which are not historical facts, are forward-looking statements within the meaning of the Private Securities Litigation Reform Act of 1995. Our actual results, performance or achievements may differ materially from those expressed or implied by these forward-looking statements. In some cases, you can identify forward-looking statements by the use of words such as “may,” “could,” “expect,” “intend,” “plan,” “seek,” “anticipate,” “believe,” “estimate,” “predict,” “potential,” “continue,” “likely,” “will,” “would” and variations of these terms and similar expressions, or the negative of these terms or similar expressions. Such forward-looking statements are necessarily based upon estimates and assumptions that, while considered reasonable by us and our management, are inherently uncertain. Factors that may cause our actual results, performance or achievements to differ materially from current expectations include, among others, the rate and pace of economic recovery following economic downturns; levels of spending in business and leisure segments as well as consumer confidence; declines in occupancy and average daily rate; the financial condition of, and our relationships with, third-party property owners, franchisees and hospitality venture partners; the possible inability of third-party owners, franchisees or development partners to access the capital necessary to fund current operations or implement our plans for growth; risks associated with potential acquisitions and dispositions and the introduction of new brand concepts; failure to successfully complete proposed transactions (including the failure to satisfy closing conditions or obtain required approvals); changes in the competitive environment in our industry, including as a result of industry consolidation, and the markets where we operate; general volatility of the capital markets and our ability to access such markets; and other risks discussed in the Company's filings with the U.S. Securities and Exchange Commission, including our Annual Report on Form 10-K, which filings are available from the U.S. Securities and Exchange Commission. These factors are not necessarily all of the important factors that could cause our actual results, performance or achievements to differ materially from those expressed in or implied by any of our forward-looking statements. We caution you not to place undue reliance on any forward-looking statements, which are made only as of the date of this press release. We undertake no obligation to update publicly any of these forward-looking statements to reflect actual results, new information or future events, changes in assumptions or changes in other factors affecting forward-looking statements, except to the extent required by applicable law. If we update one or more forward-looking statements, no inference should be drawn that we will make additional updates with respect to those or other forward-looking statements.